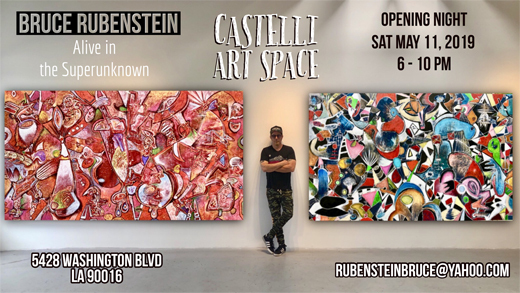 On May 11th, 2019, “Alive in the Superunknown” opens at Castelli Art Space in Culver City. 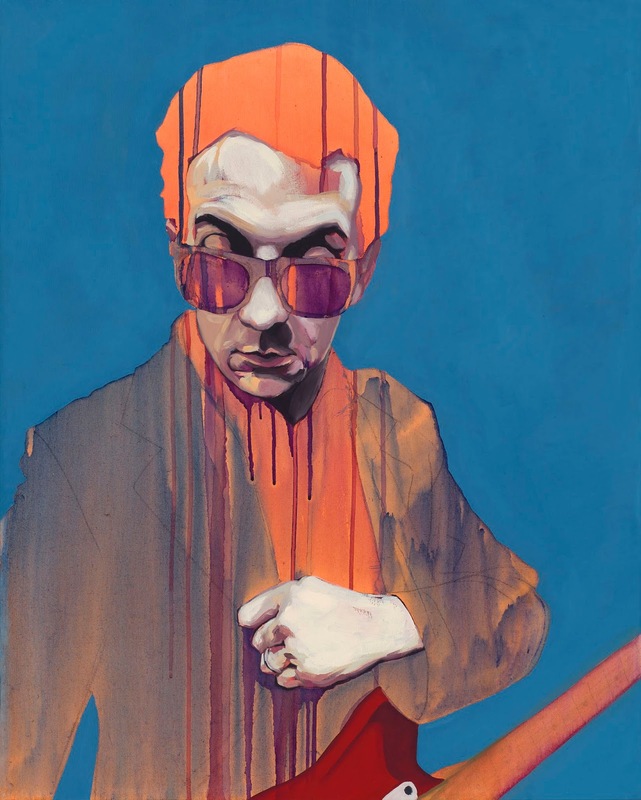 The solo exhibition features the paintings of Bruce Rubenstein. Born and raised in New York, he was a working artist, then moved to Los Angeles to begin working in the entertainment business in 1985. The artwork entitled Alive in the Superunknown (same name at the exhibition) was created in multiple layers. “I usually work on raw canvas, meaning unprimed so it has a bit of tooth. This gives the overall painting a gritty base to build on top of. Some of the residual colors remain intact as I pass the white oil-bar over them. To make the white lines pop I outline them with a charcoal vine giving the piece a three-dimensional feeling. My intention is to create an unknown alien language, a Matrix of sorts, similar to ancient Egyptian hieroglyphics. The overall goal (my intention) is that the viewer will eventually interpret his or her own truth from what they are seeing.” Rubenstein’s work has been exhibited and collected worldwide. 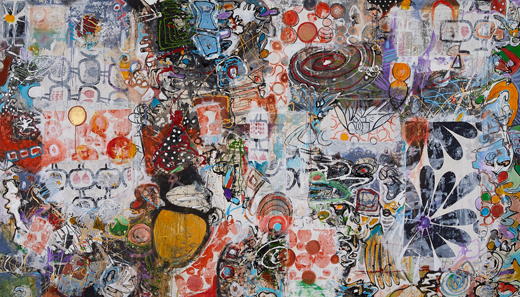 Michigan native Jorin Bossen is set to exhibit work at the Upper West. Known for its delicious cuisine, the Santa Monica restaurant features art on the walls and brings in a new artist every few months. The solo exhibition entitled "Notes on Gesture" will feature twenty-five artworks. 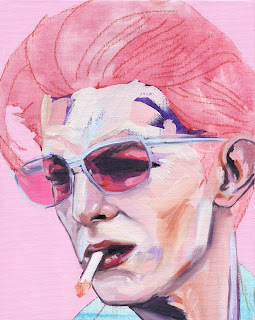 Image: Thin White Duke (Red), 2016, oil, acrylic, and pastel pencil on canvas board 10 x 8 in. Bossen was raised by artists. Inspired by his father, a photographer and his mother a ceramicist, he was drawn to art since he was a child. His parents would provide paper with colored pencils and it kept him busy for hours. “My brother and I would draw fantastical scenarios. He moved on to other interests, but I kept with it.” Bossen eventually started painting in his junior year at Kalamazoo College. Now his process includes drawing, photography first, but he will also use a computer as a starting point for many of his works, but added, that the final product is painting. Sound Salvation (Elvis Costello) 2017 oil, acrylic and pastel pencil on canvas 30 X 24 in. When asked what inspires him, he replied, “I look for images that interest me. I take these from photos that I take or friends’ photos, as well as magazine, and movie stills, pretty much from anything that I feel drawn to. Whenever he starts a new painting, these are go-to images for him. “I will look through these images to see what I am drawn to, what about them I currently find most interesting. 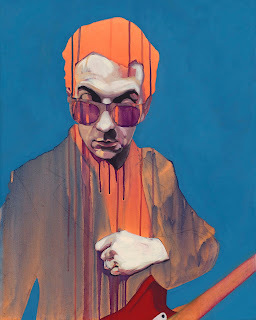 Sometimes it is the facial expressions, or how figures interact with one another, it might be a gesture or a mood that the figure conveys.” Then he creates sketches of the paintings first, either by hand or on the computer. Once he has decided on the layout, the work begins.